Then aliens, now star cave paintings: Were ancient humans aware of Universe's dark secrets? Many people believe that ancient humans came to know about the dark secrets of space with the help of alien visitors from deep space. A few years back, archeologists discovered pre-historic paintings dated back to 10,000 years that depicted aliens and unidentified flying objects (UFO). 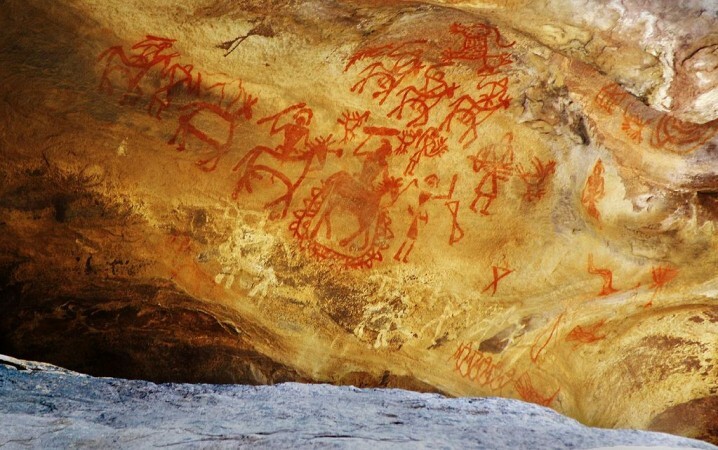 These rock paintings discovered in Charama, India soon became a hot topic among extraterrestrial buffs, and many people considered it an authentic proof of alien existence. Now, a team of researchers at the University of Edinburgh has spotted another set of ancient cave paintings which made many experts believe that early humans were aware of astronomy. The cave paintings supposedly more than 40,000 years old were discovered at various sites across Europe, and they suggest that ancient humans used to keep track of time using the knowledge of how the position of the stars slowly changes over thousands of years. Researchers who took part in this study revealed that symbols depicted in the caves are actually constellations, and they were used to represent dates and mark catastrophic events like asteroid hits. If the speculations of these researchers are right, ancient people were well aware of the effects which happen on earth due to its gradual shift of rotational axis. "Early cave art shows that people had advanced knowledge of the night sky within the last ice age. Intellectually, they were hardly any different to us today. These findings support a theory of multiple comet impacts over the course of human development, and will probably revolutionize how prehistoric populations are seen," said Martin Sweatman, a researcher at the University of Edinburgh and the lead author of the study, Eurekalert.org reports. Soon after the discovery of these European cave paintings, conspiracy theorists soon jumped to the conclusion that aliens from deep space have direct involvement in teaching ancient humans about astronomy and space. As per these conspiracy theorists, aliens have been visiting the earth for hundreds of thousands of years, and depiction of these extraterrestrial beings on Indian caves is a strong sign of their existence. Conspiracy theorists argue that ancient aliens which visited earth were often called 'Starmen' by humans. Due to their impeccable advancement in technology, humans often misunderstood them as Gods, and some section of people even started worshipping these extraterrestrial visitors.